What is unique about Bianco Smile's Formula? We have gone back and forth with dentists / manufacturers to come up with a unique, Bianco Smile formula that has shown guaranteed results to whiten your teeth. We use 3 Primary Whitening Agents to ensure maximum results, that act to gradually whiten the inside and outside layers of your teeth with each use. Throughout the whitening process, we have ensured that no tooth erosion occurs and that your teeth's enamel is not damaged in any way during the whitening process. 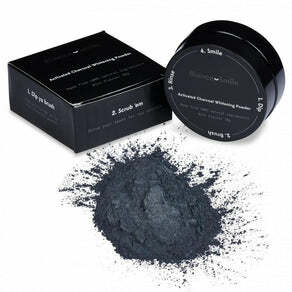 What is our Activated Charcoal Whitening Powder Made From? We offer 100% Natural, Organic, and Vegan Teeth Whitening options, for those who wish not to use peroxide and other chemicals to whiten their teeth. The powder is made from Activated Coconut Charcoal, and has a mint taste. It really does work, and we can't wait for you to try it yourself! How Often & When Should I Use Bianco Smile Products? We recommend to brush your teeth with small amount of Activated Charcoal Powder once a day at night. Scrub lightly in a circular motion for around 2-3 minutes then rinse thoroughly. Then give your teeth a short, light brush with your regular toothpaste or best to pair with ourActivated Charcoal Toothpaste to remove any excess charcoal in your mouth. It works best during night hours, which is a long period without any activity and it's very important to sleep with clean mouth. For best results, we recommend using for a period of 14 days, every evening then you can brush once or twice a week to maintain the whiteness of your teeth. For more teeth whitening information check out our blog: "What You Should Avoid After Whitening Your Teeth". Each syringe (4.5ml) has enough gel for 2-3 usage (once per day). We recommend to wait between 2-3 months in between each completed cycle. How do I use Bianco Smile's Teeth Whitening Products? 1) Dip - Dip the head of your brush into water to dampen the brush bristles. 2) Scrub - Scrub your teeth with the charcoal powder for 2-3 minutes, covering all surface area of your upper and lower teeth. Do not swallow the powder. 3) Rinse - Once you are finished scrubbing, rinse out your mouth thoroughly. 4) Smile - You're on your way to whitening your teeth, and giving yourself a brighter, Bianco Smile! 2) Mould - Place mouthpiece in your mouth while soft and mould to your teeth - do so by lightly using your fingers and tongue to push the mouth piece tight around your upper and lower teeth. 5) Smile :) - Enjoy a whiter, brighter, Bianco Smile! 1) Peel - Peel off the strip from the backing. 2) Stick on - Apply the upper and lower stripers to your teeth. Leave on for 2 minutes. 1) Scrub - Brush your teeth and floss. 2) Apply - Keep a wide smile, apply gel onto teeth and use the brush to spread the gel evenly on teeth (avoid gums). 3) Rinse - Let gel dry on teeth for 10 minutes, then rinse mouth with water. 4) Chill - Refrain from eating or drinking for 30 minutes. 5) Combine To get better whitening results, you can use the gel together with the Bianco Smile LED light (sold separately). 2) Twist - Twist base of pen to dispense gel. 3) Apply - Keep a wide smile, and apply gel onto teeth (avoid gums). 5) Chill - Refrain from eating or drinking for 30 minutes. Or you can use in conjunction with your Bianco Smile LED Light Kit! How often do I need to whiten my teeth? It all depends on your diet. If you drink coffee, wine, tea every day, your teeth will naturally show more stains that someone who does not include such drinks in their diet. Once you have completed the full course of the relevant applications for each product, we recommend 1 - 2 applications every fortnight in order to ensure you maintain your Bianco Smile. How long will my teeth stay white for? Results do vary between each person, depending on your diet / drinking habits. On average, results will last between 1-3 months, based on 8-10 applications of each product. Do you have Braces, Caps, Crowns, Veneers? We would recommend that you wait until you have your braces removed in order for you to achieve consistent results. Also, teeth whitening will not work on Caps, Crowns or Veneers. If you wear braces, only the outsides of your teeth will be whitened, leaving your natural teeth colour to remain the same under each brace piece. This is entire up to you however, and you can always re-whiten your teeth after removing your braces! How does the LED light technology work? Our Bianco Smile unique formula breaks down far quicker with the use of an LED light. This is how your teeth are whitened in only 20-30 minutes, making application fast and effective. Are Bianco Smile products safe if i'm pregnant or breastfeeding? Our charcoal teeth whitening product range is 100% safe, however we recommend that you check with your GP / Doctor first if you are pregnant or breastfeeding. We are more than happy to consult with you if you need more information regarding any ingredients we use for any of our products. If you have concerns, please email us directly. Will it cause sensitivity or damage to my teeth? Our products will not cause sensitivity or damage to your teeth. We have included special ingredients to our whitening gel to ensure that no sensitivity, tooth erosion, or enamel damage is encountered during the whitening process. In order to active your light, you must remove the plastic sheet located between the batteries. How do I get my money back if I do not see any improvement on my teeth? We do not take responsibility for any misuse of our product. Please use the product in guidance with Bianco Smile's recommendations. We do not accept returns once an item has been shipped. For distribution / wholesale enquiries, please email us at support@biancosmile.com. Distribution / wholesale rates will apply depending on the quantity ordered. For health reasons, wholesale orders will not be refunded once they have left our factory. It is the onus of the purchaser to clear the goods through customs. Whilst Bianco Smile will endeavour to help clear goods through customs, it is not the responsibility of the company to absorb costs that come from re-ships or failed clearances. Please provide us with your location ,order quantity, and your means of distribution. We ship all of our products out of our warehouse in the USA. All orders are tracked - you will receive an email containing your tracking number within 24 hours of your order being dispatched. Orders within the USA take 2-4 business days for delivery, with international orders taking between 6-10 business days (depending on your location). Best of all, shipping is absolutely free! Will I have to pay Duty and VAT charges? If you are located in EU, you may receive duty and VAT charges upon import. Bianco Smile has no control over these charges - it is entirely up to the local government / border security and customs office. If you refuse to pay the additional fees at the time of delivery, then your shipment will be returned to us. At that point in time, Bianco Smile agrees to refund your purchase cost (minus shipping cost to and from your country).